This past weekend (March 28th - March 30th) our team was up in North Bay participating in the North Bay District Event. Our team traveled up to this competition with our sister team 1374 where they were also competing. This event was so much fun, and there was added fun with the team social where we got to join with all the other competing teams to socialize, eat, and just have fun. When it comes to the competition, our team ended up being ranked in 25th at the end of qualification matches. During alliance selection, our team was chosen as the second pick on the 6th alliance. We played well in the playoffs but we were unfortunately eliminated in the quarterfinals. 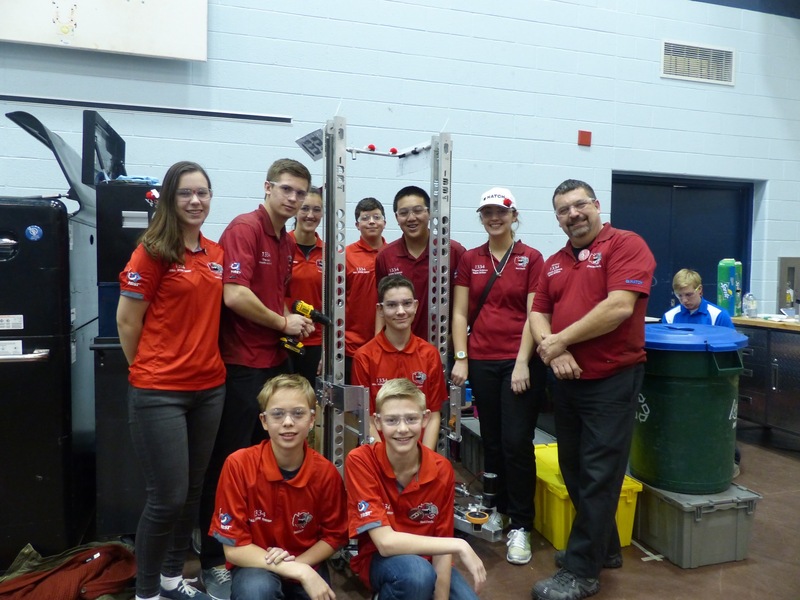 We had lots of fun at this event, and hopefully, we did well enough at both of our competitions to qualify for the FIRST Ontario Provincial Championships. From March 15th to March 16th our team attended the Ryerson University District Event. We got to compete in this year's game, Destination: Deep Space with our newly built robot PHIL! (Packer and Hauler of Intergalactic Luggage) We played some well-fought games and we came in 14th at the end of qualification matches. During alliance selection, we were the second pick of the seventh-placed alliance and joined with teams 6162 and 7690 to fight for a spot in the finals. We made it to a tie-breaking quarterfinal match, where we unfortunately lost and did not continue onto the semifinals. 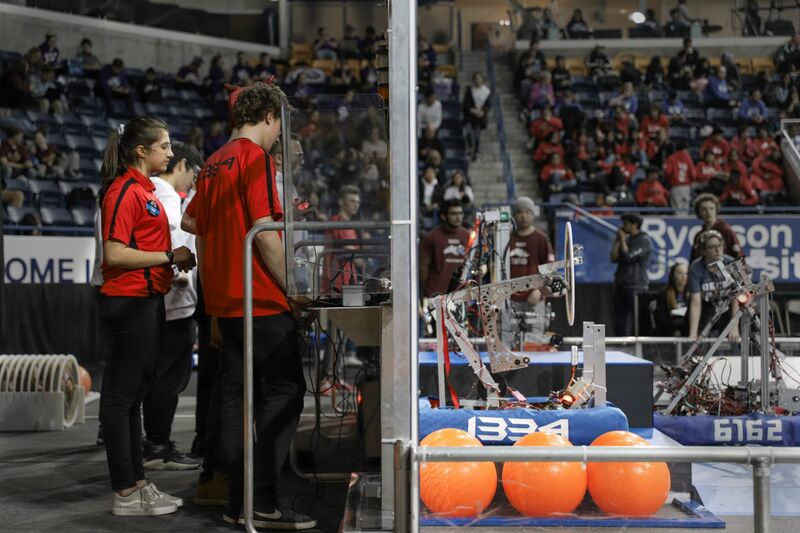 During the awards ceremony, our team was called down to the field to high five the judges when it was announced that our team won the Judges Award! This award was given to us because of our work with the CNE and our other outreach. Overall we had a great time, and we are excited to be competing at the North Bay District Event in two weeks. 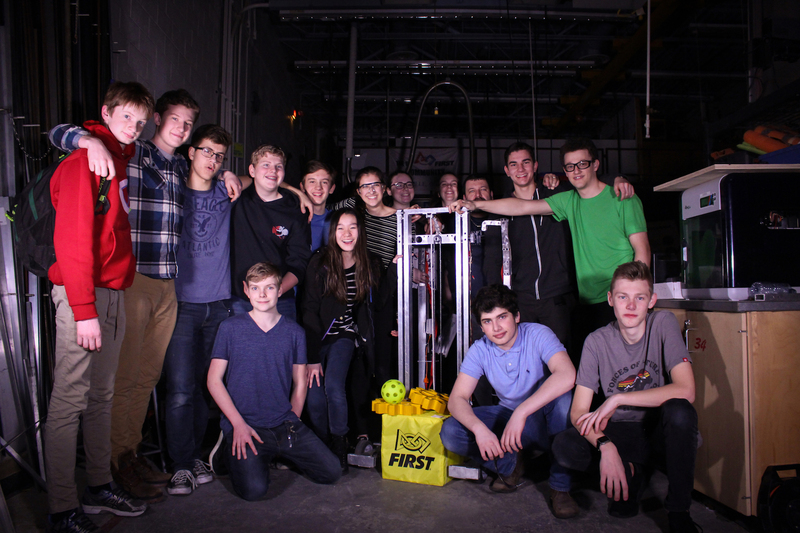 At 10:45 our team celebrated a successful end to our team's 15th build season! We worked hard as the clock was counting down and by the end of this year's bag day, we have a robot that is ready to compete! While we are super excited for the upcoming competition season, we are also grateful for our sponsors, mentors, and community. Without them, our team simply could not exist. We look forward to competing at the North Bay and Ryerson District Events in the coming weeks! 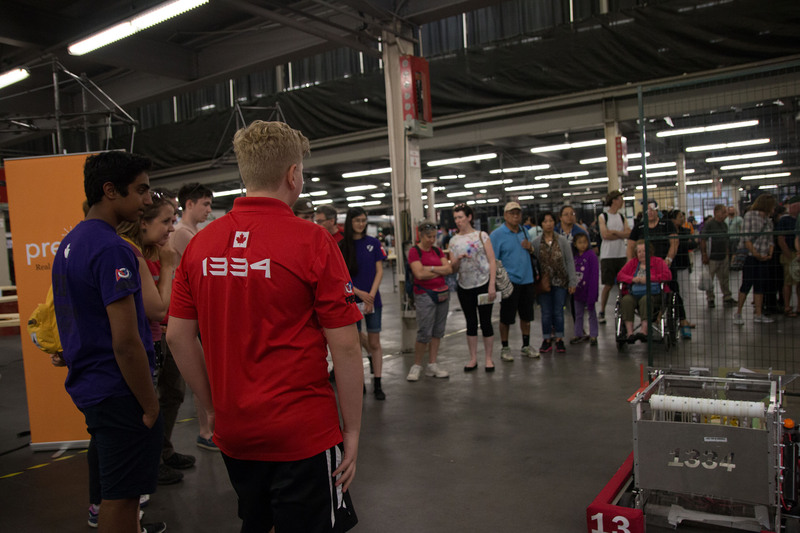 Our team, along with our sister team 1374 joined with all the other Halton FRC teams to see what the new game will be for this upcoming competition season. 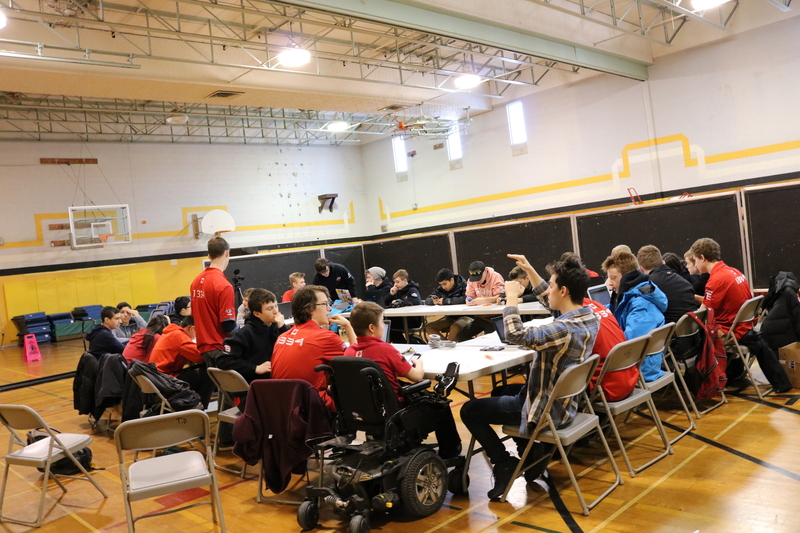 After finding out about how the new game is played, all the teams split up and started discussing strategies and possible robot designs for the competition. After a few hours of the teams being separated, we all came back together and shared what we all came up with. It was lots of fun discussing the new game and meeting people that are all interested in robotics. Good luck to all teams on the upcoming build season! It was another great night at the Oakville Town Hall! 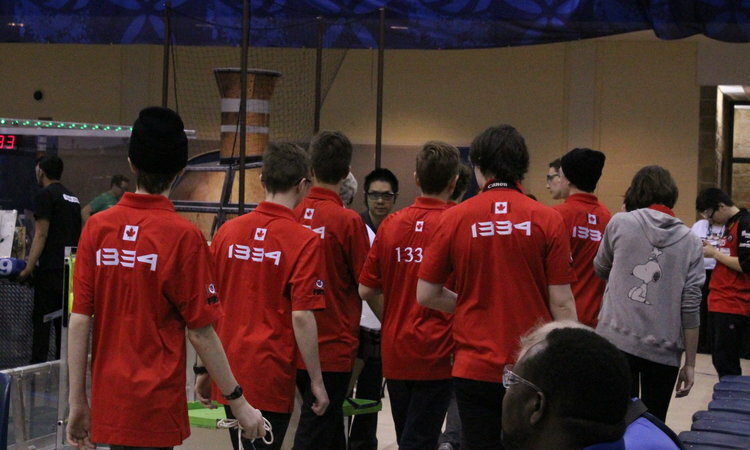 Our team, along with our sister team 1374 played host to Oakville's FIRST Community Event. 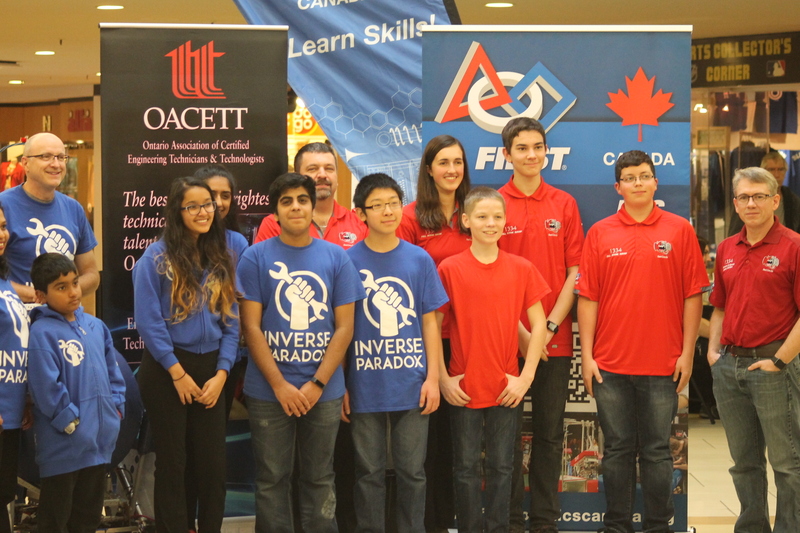 All other FIRST teams in Oakville were invited to this event, along with volunteers, mentors, local politicians, and FIRST heroes. At the event, we celebrated all of our accomplishments over the past year and recognized people that help make the robotics programs in Oakville so great. Everybody had a great time, and we are excited to see everybody next year! 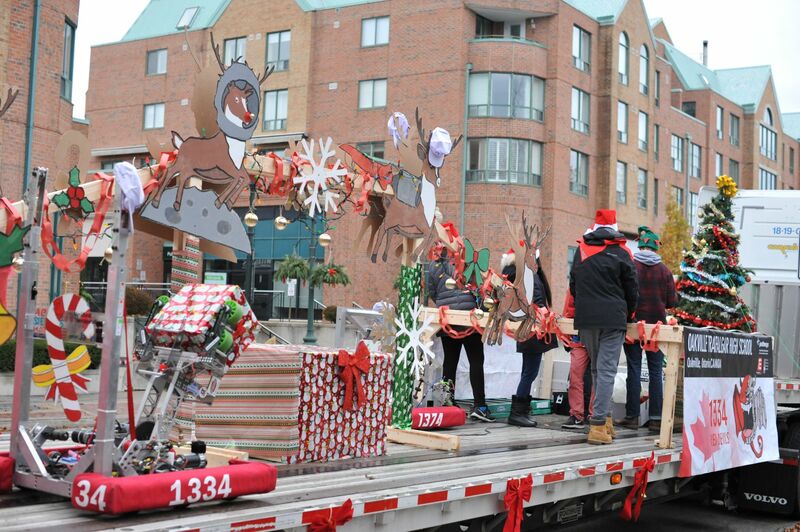 Once again OT Robotics participated in Oakville Santa Claus Parade. The night before the parade, our team worked together with our sister team 1374 to decorate our beautiful float, and we were up early the next morning to spread some holiday cheer to the community. Many people showed up to experience the parade in person, as well as being broadcast on Oakville's various cable news channels. Everybody had lots of fun, and we are very excited to participate in the parade next year! Our team for the second year drove down to Windsor and we competed in the Southwest International Offseason Event, hosted by FRC team 772 the Sabrebytes. 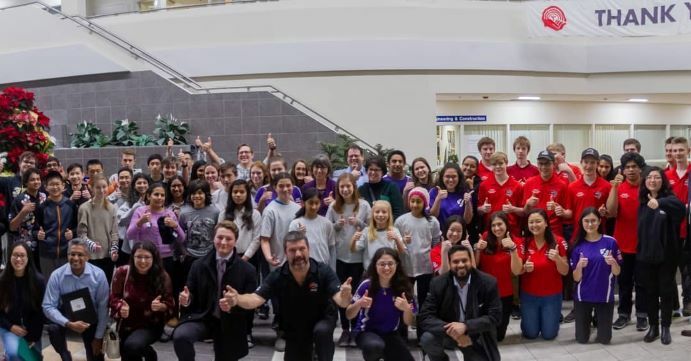 Our team and our sister team 1374 drove down to Windsor, the day before the competition and stayed overnight in a hotel to give new members the experience of a stay-over robotics competition. We had lots of fun at the competition, and we even place well enough to make it to the playoffs. We played really well in the playoffs and even made it to the finals. We were defeated in the finals but we were still awarded as finalists for the competition. It was a fun time and we are excited for next year! This past summer we again ran our Robotics Camp with the Town of Oakville to teach kids robotics and give them a fun camp experience. This year we continue to have our 8 weeks of camp at the Queen Elizabeth Park Community and Cultural Centre, and this year we increased the number of weeks at River Oaks Community Center from 4 weeks to 5 weeks. We provided the campers with Lego Mindstorms and VEX robot kits and taught the campers how to build and program their robots while also organizing other fun camp activities and games to give the kids a full camp experience. By the end of each week, the campers had lots of fun and we are hoping to see more kids next year! 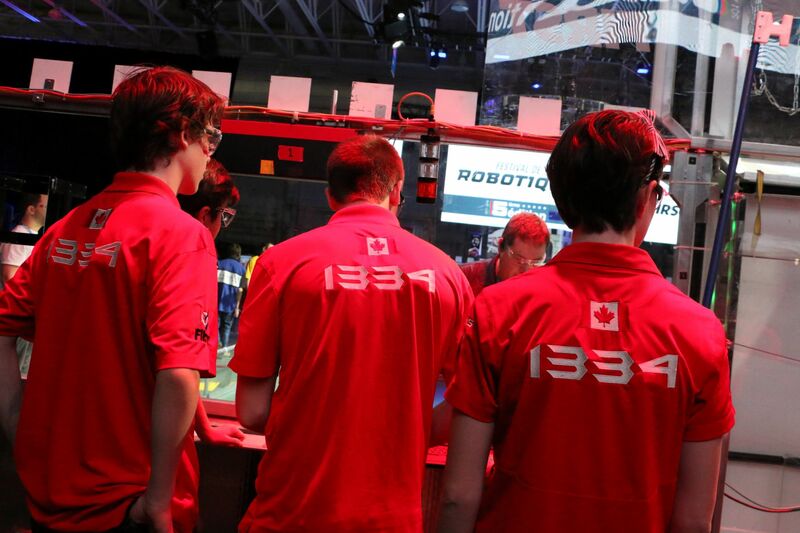 This year at the CNE (Canadian National Exhibition) we hosted and competed in an offseason event where many FRC teams were invited to compete in the years game FIRST Power Up. We also had a LEGO Robotics table where we would talk to kids and parents about how they could get involved in robotics. It was a very fun competition weekend and we hope to continue hosting this offseason event in the future. The main street of the downtown core was again made for the public to walk on, and people were able to enjoy what all of Oakville has to offer. We were of course in attendance with our sister team 1374 to promote STEM and show kids and adults alike what robotics is all about. People again had the opportunity to get up close and personal with all of our team members and of course our robots. We gave people the chance to actually drive one of our robots around and give kids rides on our chair-bot. We are very excited to see everybody next year! 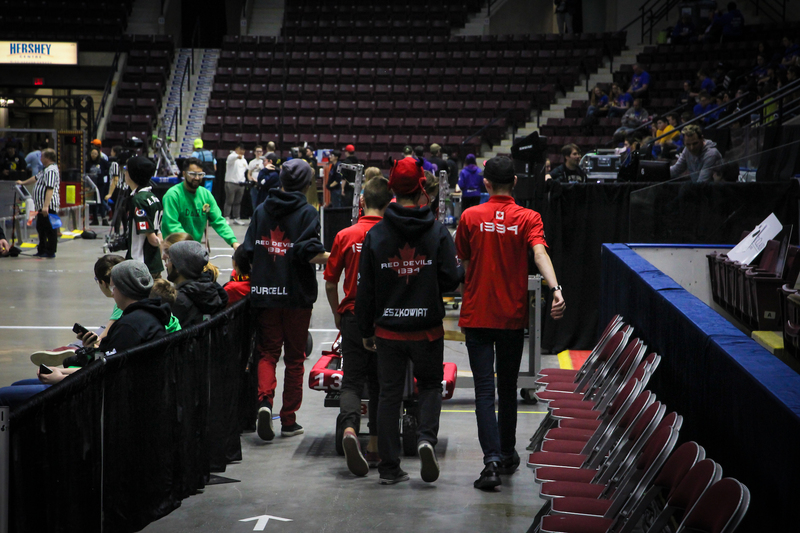 This year our team was fortunate enough to rank 53rd in Ontario at the end of our qualification level events. Being within the top 80 allowed our team to compete at the Hershey's Centre in the Ontario District Championships - Science Division on from April 12th to April 14th. In spite of ranking 37th after qualifications, we were lucky enough to be picked by the #2 alliance and played alongside team 610 (Coyotes) and team 4678 (CyberCavs) until the semi-finals where we were eliminated. Overall we ranked 43rd in Ontario, just out of reach of World Championships in Detroit. 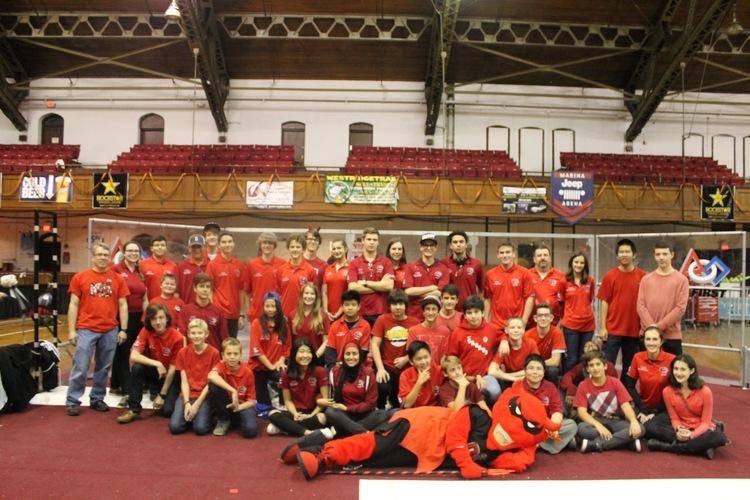 From April 6th to April 8th team 1334 attended the McMaster University district event. After ranking 13th in qualifications, we were picked by the #8 alliance alongside team 6070 (Gryphon Machine) and team 6632 (Supreme Robotics) but were eliminated in the quarterfinals by the #1 alliance. 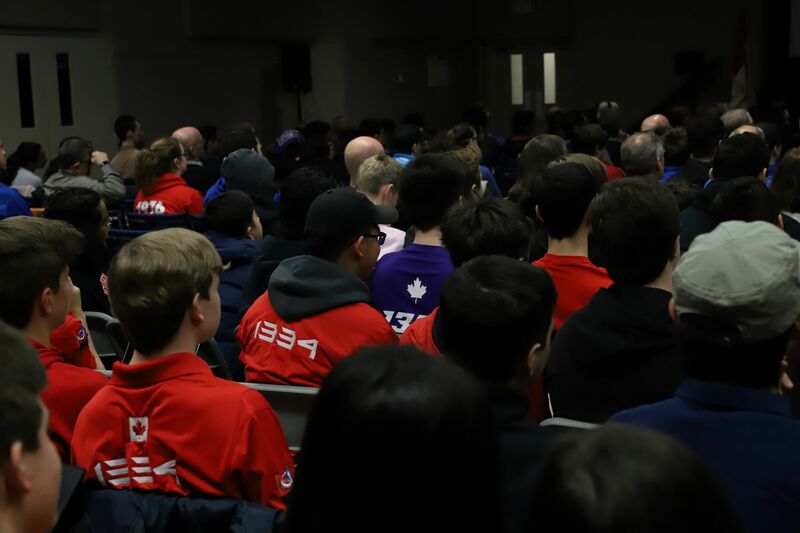 From March 22nd to March 24th team 1334 attended to the Waterloo University district event. The team ranked 5th in the qualification matches, becoming the #4 alliance captain. We worked hard alongside team 4852 (DM High Voltage) and team 4814 (We MARS incubators) to make it to the semifinals but were eliminated by the #1 alliance. After a long 6 weeks, we have finished building our robot working close to midnight tonight to get it done. "OLIVIA" (Oustanding Launcher Inside a Video-game Inspired Arcade) has been put away in the bag and will stay there until our first competition in Waterloo. Thank you to everybody supporting our team for the past 6 weeks. Thanks to parents who made and brought us dinner, everybody was very happy with all the delicious food that was made for us. Special thanks to our mentors, Mr. Woods, Katlin and Jamie for their guidance on helping us build a robot and become closer as a team. It was a build season full of teamwork, laughs, friends, fun and of course, ROBOTS! On Saturday, January 6th, our team went to the Halton kickoff! All the members had fun and the rookies discussed strategies for the 1st time! Our team had the opportunities to make some strategies on their own and then shared it with the other Halton teams! We wish good luck to all of the teams and hope to see you at competitions! 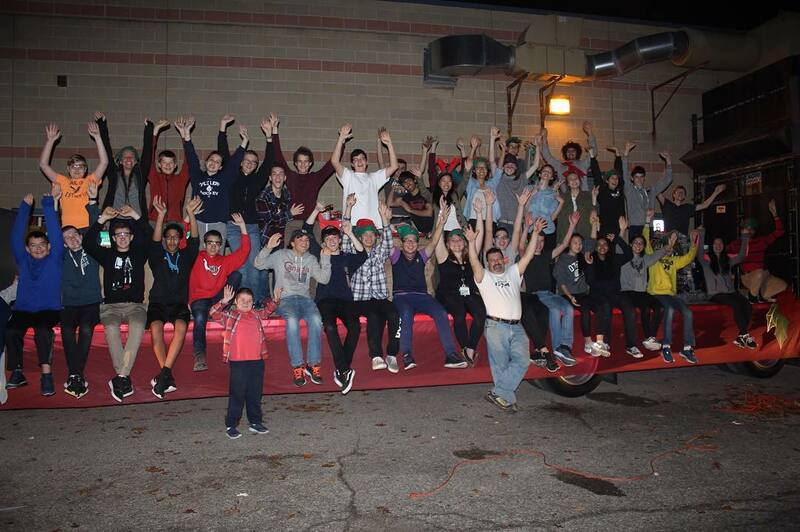 On November 17 teams 1334 and 1374 built a beautiful futuristic themed float for the Oakville Santa Claus Parade. The next morning we were downtown Oakville bright and early to participate in it. We exposed many people to FIRST, and we were really happy to see all the joy in the crowd even with the rainy weather. We can't wait to participate again next year. 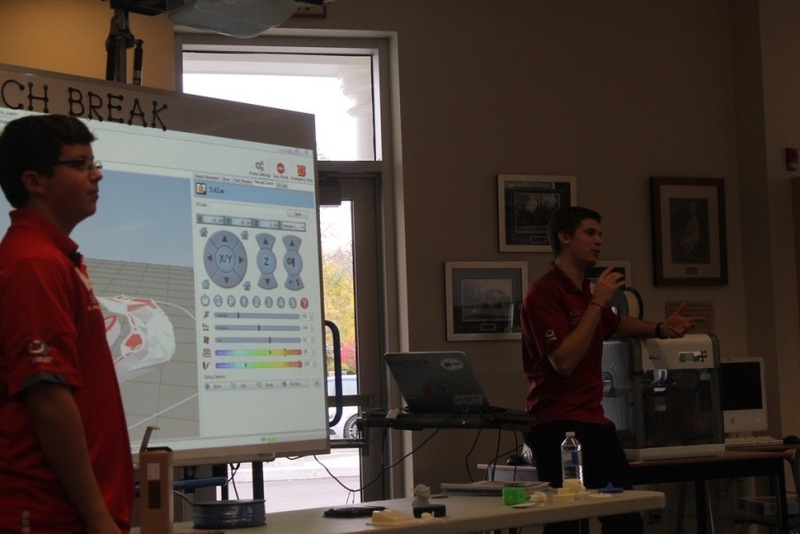 On Saturday, November 11, our team attended the STEMly Cup offseason event. 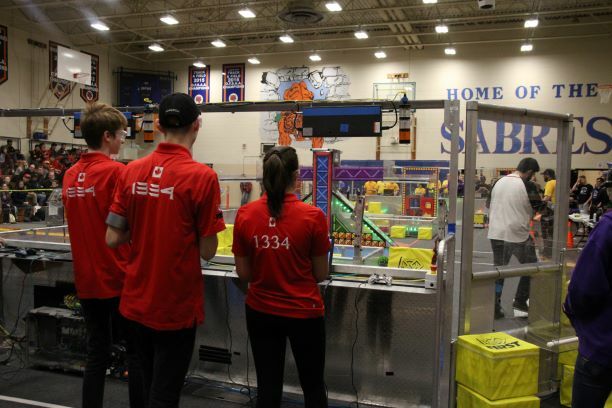 Team 1334 was selected by teams 2609 & 4917 to be in the second alliance, making it to the finals. Congrats to our sister team 1374 by making it to the semi-finals. Team 1334 also won the Catalyst Assist award for best team support and development. A big thank you to the 4039 (MakeShift Robotics) & 5406 (Celt-X) FRC Teams for hosting the event, good luck and see you in the upcoming season. On Saturday, October 28, our team attended the Southwest International off-season event hosted by Team 772. Our students and mentors are very proud to have won the Best Robot Award along with being in the winning alliance. We were very pleased to work alongside our alliance members Team 5408 & Team 6544. This event was a great opportunity to prepare our new members for the upcoming season. Hopefully, we will be attending Southwest International for years to come. 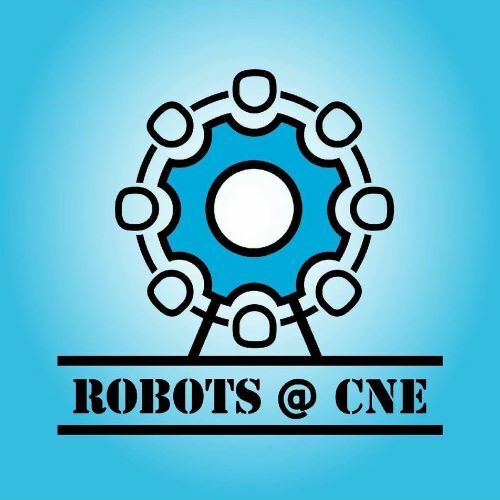 On the opening weekend of the CNE, our robotics team was part of the Innovation Garage where we showcased our robot NEMO to the public. We showcased his ability to deliver a gear to a peg and we let people drop the gear right into his pickup system. We also had a LEGO robotics table where we showed kids how they could start their robotics careers and talked to them about how fun robotics is. We had a great time that weekend and we are excited to be able to do it next year! This past summer we ran a Robotics Camp with the Town of Oakville to teach more kids and give them the opportunity to explore robotics. However, this year was extra exciting as our team increased the number of weeks from 6 weeks to 8 weeks of camp at the Queen Elizabeth Park Community and Cultural Centre. Some more exciting news from this year is that we had 4 weeks of camp at another location, River Oaks. With two locations there is now the ability for us to reach out to even more kids and get them interested in robotics and STEM. 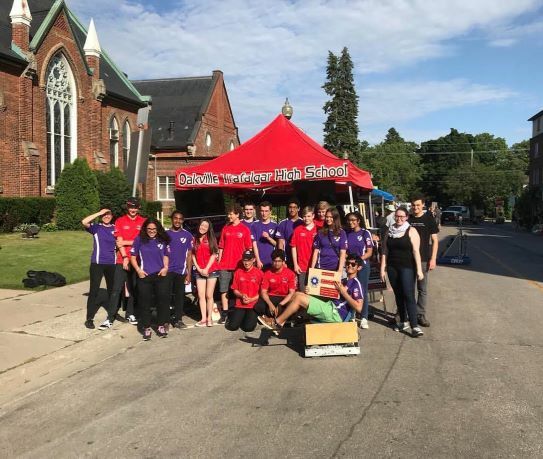 OT robotics attended the James W. Hill school fair on May 27th to promote STEM in the community, help the school raise money, and promote our teams by showing off our robots. 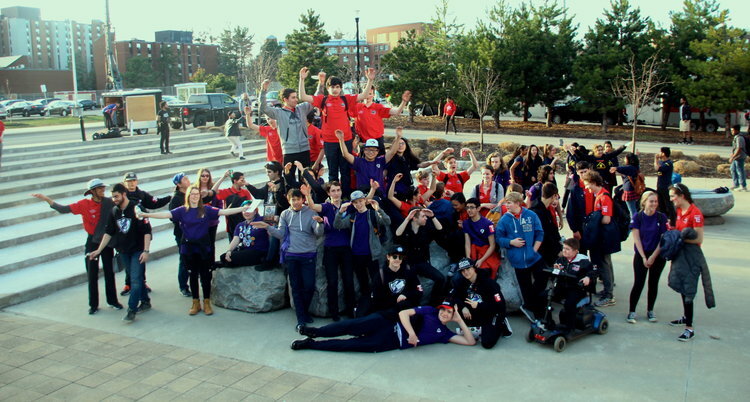 On the weekend of April 7th - 9th our team competed at the McMaster University District Event. The mascot was out interacting with people, and there was excitement in the pits and on the field. At the end of qualification, we were ranked 9th with a score of 8 wins and 4 losses. This ranking lead us to become an alliance captain for the 7th place alliance where we were able to pick other teams to join us in the elimination round. We put up a hard fight in the quarterfinals but lost in a third tie-breaking match. Mr. Woods was nominated for the prestigious Woodie Flowers Award, which is an award that recognizes mentors who lead, inspire and empower using excellent communication skills. One of our students, Aaron Leszkowitz was recognized as a Dean's List semi-finalist. Dean’s List is an award to recognize the leadership and dedication of FIRST’s most outstanding secondary school students. Both Mr. Woods and Aaron will move on to the District Championships where they can win these awards for all of Ontario. On the weekend of March 24th - 26th our team competed at the Georgian College District Event. We had a great time meeting new people, making new friends, and having many laughs. We were ranked 24th after qualifications, with a score of 5 wins and 7 loses. We were chosen as the second pick on the 7th place alliance and were knocked out of quarterfinals in a tiebreaker after 4 well played matches. 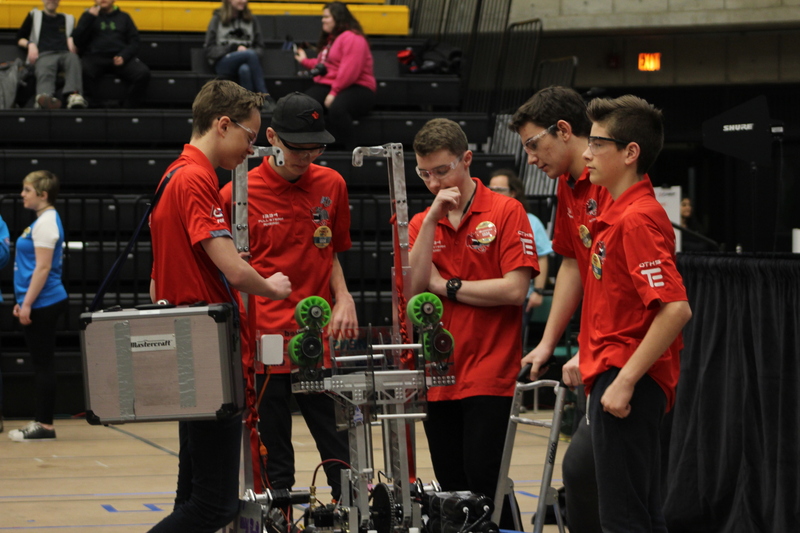 Our pit crew was working diligently to fix any problems with the bots that happened between matches, and our drive team was strategizing with our alliance partners before every match. Our media team was taking pictures and videos to document the entire trip and making posts and videos for our social media. Our scouting team was hard at work scouting every bot for every match to help us decide alliance partners for the playoffs. It was a fun weekend full of competition, strategy, music, and dancing. On February 21st we stayed in the shop until close to midnight doing final work on our robot. "NEMO" (Nicely Engineered Master of Offence) has been put in the bag and will stay there until our first competition at Georgian College in Barrie. It has been a long 6 weeks of build season and everyone has put in a ton of hard work. We want to thank all our amazing sponsors for helping support and fund our team, parents for supplying dinners our committed mentors who love the robots just as much as we do, and all the hours our members have put in to make this possible. Extra special thanks to our lead mentor Mr.Woods. We wouldn't be anywhere without him and his "positive" humor. It was a season full of laughs, friends, and fun and we are looking forward to our competition in 4 weeks. 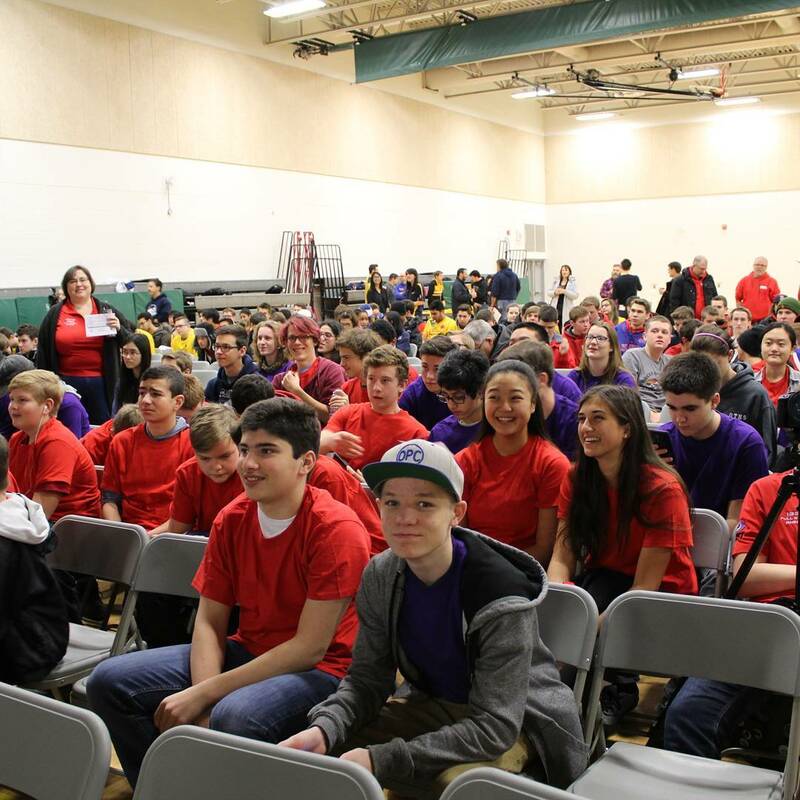 On January 7th, 2017 robotics teams across Halton go to Craig Kielburger Secondary School to learn about this year's FIRST Robotics Competition game. After the game reveal there was a session where each individual team meets to discuss strategy and how they to approach the game. On Sunday, was a brainstorming session at Maple Grove United Church to put together more ideas. 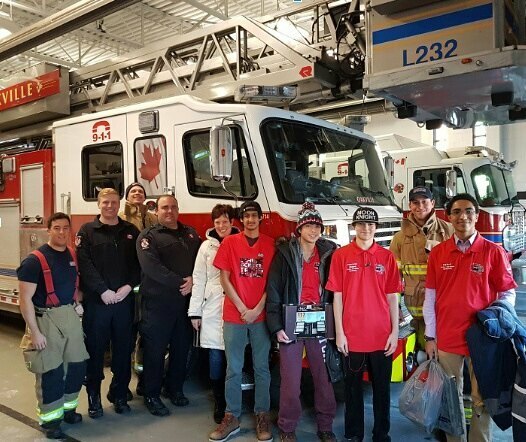 This year the OT Robotics teams are assisting the Oakville Firefighters with their 24th Annual Toy Drive. We went to the Downtown Oakville Fire Department on December 15th, 2016. Everyone had a great time at the toy drive and we would like to give special thanks to the firefighters at the Oakville Fire Department! Click here to go to their Facebook. On Saturday, November 19th our teams participated in the Oakville Santa Claus Parade for the fourth year! We all helped to decorate a beautiful float on the night before and then drove it through Oakville Saturday morning, handing out candy canes. Everyone had lots of fun, and we look forward to doing it again next year! Special thanks go to our mentor, Chuck Woods. Come on down to the Ex! The CNE opened Friday, August 20th, and our booth was running on the Friday, Saturday, and Sunday. 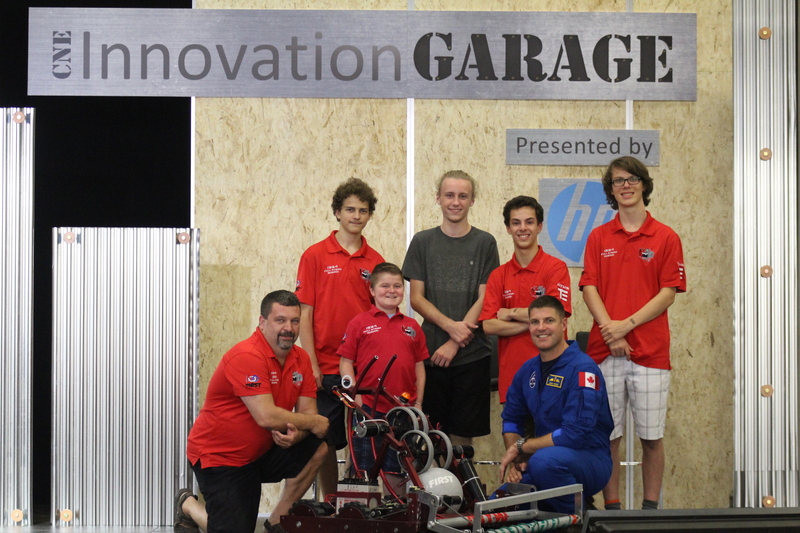 Our team was located in the CNE Innovation Garage, alongside other Halton FRC Teams. We have been using this opportunity to speak with interested families about FRC and FIRST, and to spread the word about our team. In between demonstrations of our Chairbot, visiting other Robotics booths, and using MACKENZIE to interact with crowds, our members were taking breaks to enjoy all the Ex has to offer. We also had the pleasure of meeting and taking a photo with Jeremy Hansen - an up and coming Canadian Astronaut. 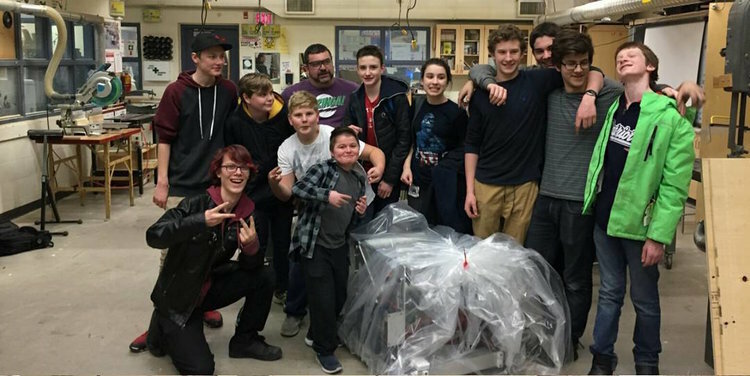 This past summer our team members have found a unique way to get involved in our community and give local youth the opportunity to explore robotics. Over 6 weeks, a dozen of our students have been running a Robotics Camp at the Queen Elizabeth Park Community and Cultural Centre. The camp is fully student-led, with our team members organizing, planning, and assembling the course structure and daily schedule for each week. The camp is for students 9-12 years of age who want to explore Vex and FLL, which are taught in alternating weeks. Each week brings new materials, ideas, and instructors. Our leaders also devise different projects and themes for each week such as space, underwater exploration, and natural disasters, so returning students can have new experiences. Campers are divided into teams as they work together to build and modify robots to compete in our weekly challenges. Our leaders were constantly on hand to assist and supervise campers, but they also added elements of fun. For example, our members built the Batmobile out of FLL lego as a fun side project that the kids would be interested in! The campers and our members have had a great time, and are looking forward to doing it again next year. Special thanks to Sarah for orchestrating the scheduling and the collaboration with the Town of Oakville, and to the QEP for working with us. 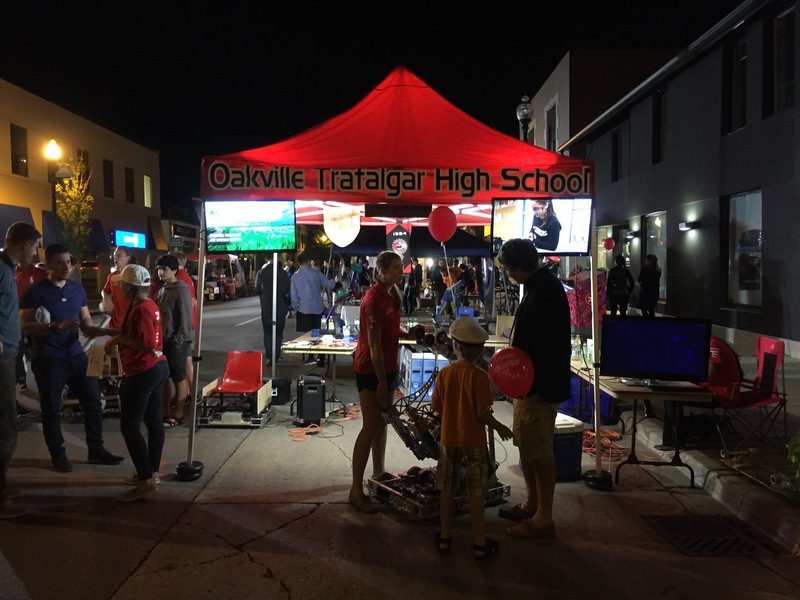 On Friday, July 15th Oakville Trafalgar Robotics participated in the Town of Oakville’s annual Midnight Madness event. The night was a ton of fun and a huge success, with our pit drawing lots of spectators. Last year’s Drive Team attracted a line-up as they gave kids rides down the block on our Chairbot. Last year’s competition robot MACKENZIE met crowds with displays of her capabilities and interacted with visitors by playing games of catch. Students made their way through the crowds answering questions and handing out information, while our new PA system allowed us to efficiently address everyone at once. 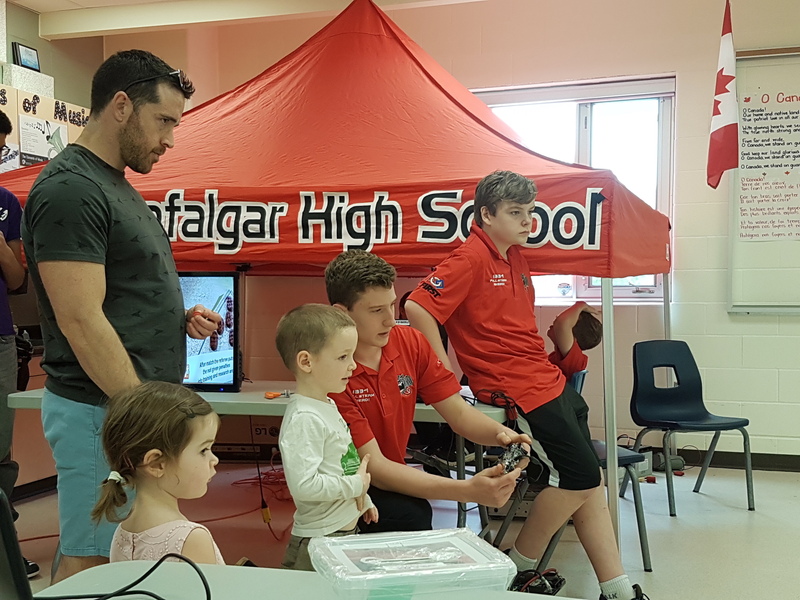 The event was a great way to increase our team profile and speak with local families about our team, FIRST, FRC, and STEAM (Science, Technology, Engineering, Art, and Math). We also spread the word about the FIRST Lego League (FLL), encouraging families who were interested to enroll their kids into robotics programs. We had over 20 OT members attend the event, working in the pits and speaking to the crowds. We would like to thank our members for being knowledgeable, hard-working, approachable and enthusiastic, and for displaying Gracious Professionalism throughout the night. 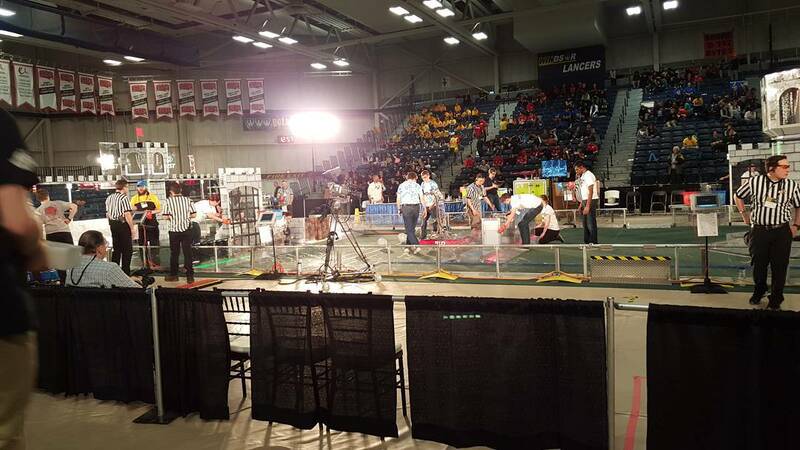 The event had a great turnout, with many other Halton FRC teams such as 3161 Tronic Titans and 771 SWAT attending. 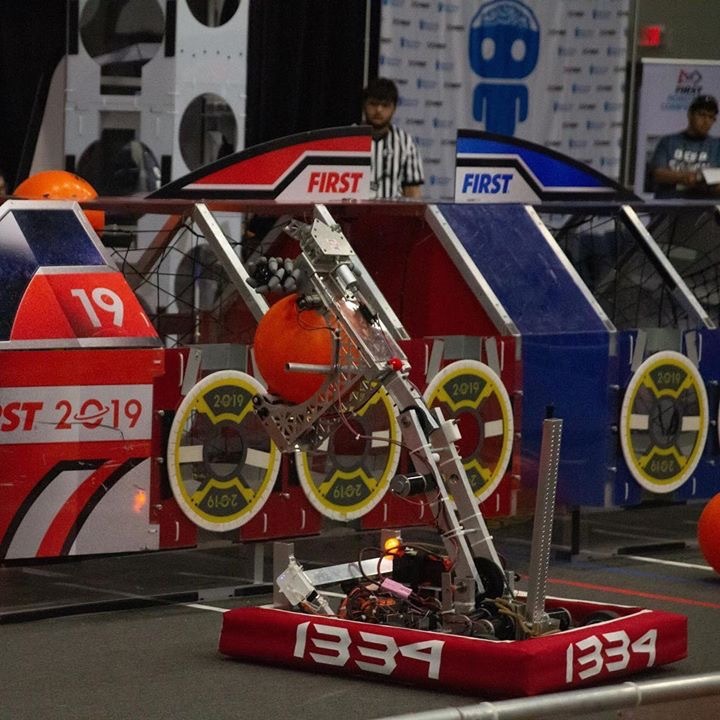 Team 3161 had great presentation outside their pit, displaying their robot’s dexterity and fine craftsmanship as it tackled obstacles from last year’s Stronghold games. SWAT brought a remote-controlled drone to the event, which captured great footage and a lot of attention from spectators. We look forward to seeing them compete next season. 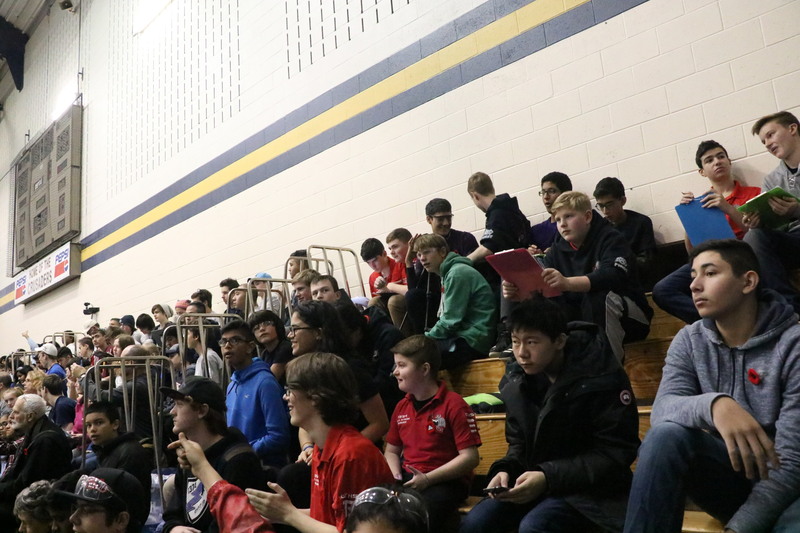 From April 6th to April 9th our team traveled all the way to Windsor to participate in the Windsor Essex Great Lakes Regional! We had lots of fun and at the end of qualification matches, we were ranked 26th out of 52 teams. During alliance selection, we were the second pick for the 8th alliance joining teams 6110 and 1075 for the playoffs. During the playoffs, we played some hard-fought games but ended up being eliminated in the quarterfinals. Although we did not make it to the finals, we still had a fun time at the competition! This past weekend (March 30th - Apri 2nd) we rode a bus all the way to Montreal with our new robot "MACKENZIE" to compete in the Festival de Robotique! At this competition, our spirit was as high as it could be, even though in the rankings we were not that high. With some tough competition, we placed in 50th place at the end of qualification matches. We were not picked by an alliance to move onto the playoffs, but our team was cheering, dancing, and just having a ton of fun. This past Halloween our teams traveled to Rochester, New York. We are excited to say we have 40 people who went to this event! During the event, we updated our social media as well as collected footage and pictures to use in a video that we will be posting during the next couple of weeks. Rah Cha Cha Ruckus is geared towards training our rookies and is a great opportunity for new members. We always highly recommend that new members to attend as they are able to to get a feel for what competitions are like, get hands-on experience, and see how each sub-team functions. 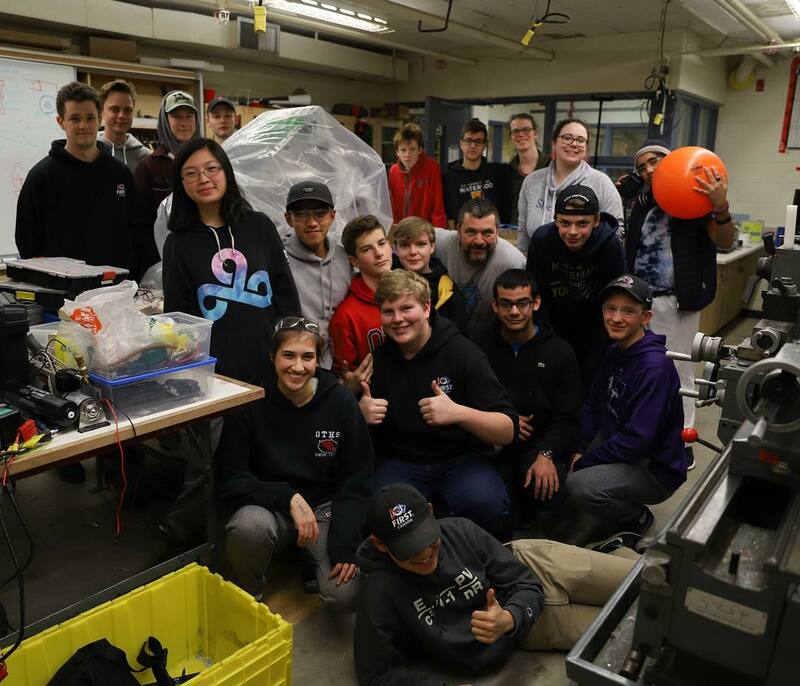 On Saturday, Nov 14th, the team competed at the first annual STEMly Cup Championship, an offseason event hosted by teams 4039 and 5406 inHamilgon. The team did very well, winning an award for creativity in robot design. In addition, we managed to secure a place on the 3rd alliance along with teams 1241 and 1285. The alliance made it all the way to the semi-finals, coming in 3rd place. We would like to thank our alliance partners for an awesome performance as well as teams 5406 and 4039 for hosting the event. On Oct 31st, some of the team members attended Team SWAT 771's annual SWATposium. We would also like to congratulate team members Justin S and Thomas M on the awesome 3D printing workshop that they did! This past weekend (March 25th - March 28th) we were at the North Bay Regional. We had lots of fun at this event and played some very good matches. We even participated in the team social which was a ton of fun. We got to meet other teams better and had a great time in the photo booth! At the end of qualification matches, we were placed in 13th position. During alliance selection, we were the first pick of the 5th place alliance. We played some well-fought quarterfinal matches but we were unfortunately eliminated. During the awards ceremony, however, we won the entrepreneurship award! This award was given to us because of our comprehensive business plan. 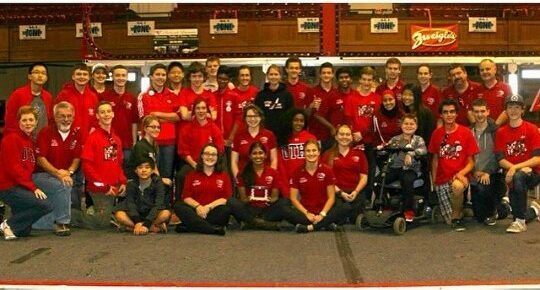 This past weekend we competed in the Waterloo Regional with our newly built robot "LAMAR"! We had lots of fun at this competition and played a well-fought competition and at the end of qualifications, we were in 28th place. Although we were not ranked very high at the end of qualifications, during alliance selection we were the second pick of the second-ranked alliance. We made it all the way to the finals but that is where we lost. However, during the awards ceremony, we received our blue banner for making it to the finals. On Saturday, November 21st, our team participated in the Oakville Santa Claus Parade! 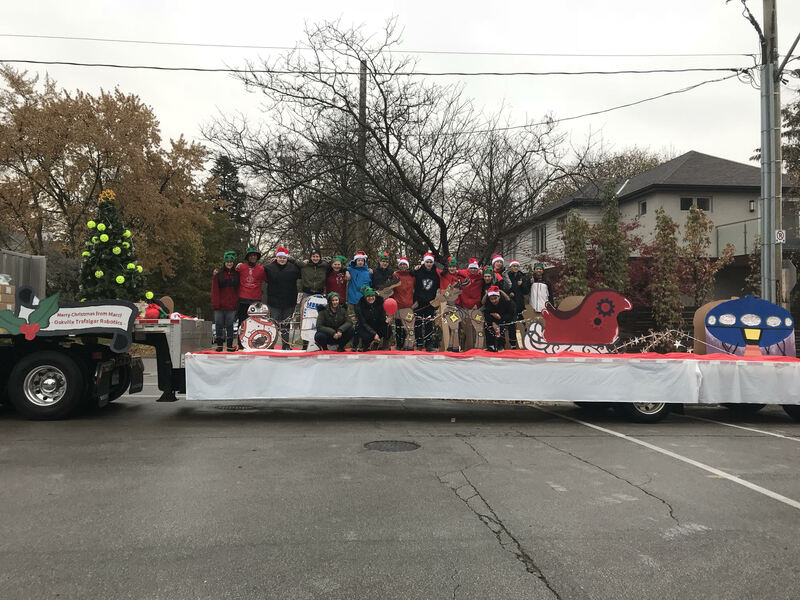 Everyone helped transform a truck into a beautiful holiday float that was driven through downtown Oakville Saturday morning. We handed out candy canes with cards attached to them which had information about FIRST teams in the community. Everybody had tons of fun and we are looking forward to doing it again next year! 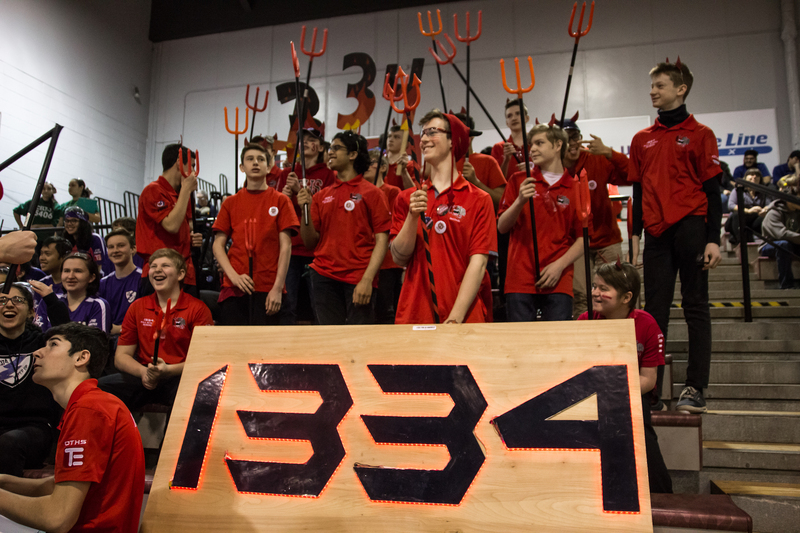 For our first competition, this year team 1334 traveled to Rochester, NY. We competed and had tons of fun! It was an opportunity for the rookie members to learn more about competition and robotics in general. The team also tested out new drivers. In addition, we won the imagery award as well as the award for collecting the most non-perishables for the event's food drive after donating over 200 dollars worth of food.